Statement issued by Abahlali baseMjondolo after the assassination of S'fiso Ngcobo on Tuesday, 22 May 2018. On Saturday our branch in eKukhanyeni, in Marianhill, held a very successful and well attended assembly. On Tuesday night, at around 7:30 pm, our chairperson in the branch, S’fisio Ngcobo, stepped out of his home to buy a cooldrink from a shop in a container next to his home. He had received death threats and was aware that it was not safe to be out at night. But the container was just a few meters from his home. He was shot, multiple times, by a group of unknown men. The police were called. They took more than three hours to arrive even though the local police station is nearby. Despite the danger large numbers of comrades immediately gathered at Ngcobo’s home. eKukhanyeni is a land occupation, in an area formerly known as eMasenseni, in Marianhill. We have another branch in the area, in an occupation called New City in Marianridge. Tensions have been escalating in the Marianhill area, which includes Marinridge, for some time. The hostility to our movement comes from the leaders of the local ANC, as well as local business interests who depend on the ruling party for tenders. We have consistently raised concerns about the conduct of the Ward Councillor, who is also named Sifiso Ngcobo, and is known as Nadar. 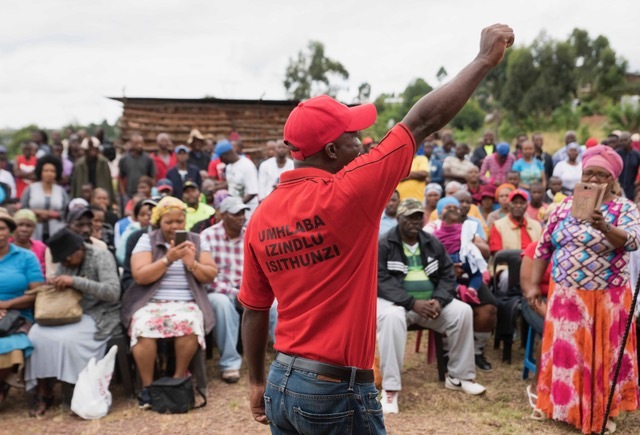 He is related to Mduduzi Ngcobo (Nqola), who was the Councillor in nearby KwaNdengezi, and is currently serving a prison sentence after being convicted for the 2014 murder of Thuli Ndlovu, the Abahlali baseMjondolo chairperson in KwaNdengezi. In March this year we issued a statement noting that after another illegal eviction in eKukhanyeni, this time by a private security company and in violation of an interdict from the Durban High Court, “three members of the movement were attacked by men driving in two unmarked vehicles. These comrades were seriously injured and are currently in hospital.” As protests escalated Nonhlanhla Zungu broke her leg while fleeing the police and Sibusiso Mngonyolo was shot with rubber bullets and sustained serious injuries. If the ANC had any concern for the lives of impoverished black people they would have responded to these statements, and the protests organised by our members, and organised an urgent investigation into their political leadership in the Ward, and the police. But they did nothing. This is not the first time that we have repeatedly raised the alarm about violent authoritarianism and intimidation by local structures of the ruling party, only to be met with silence by the ruling party, and then to have one of our comrades assassinated. This is exactly what happened when Thuli Ndlovu was assassinated in 2014. In that case women in our movement even occupied the City Hall to warn the Municipality and the politicians that Thuli’s life was in danger. But the Municipality, the politicians and the ANC did nothing and Thuli was murdered in her home. In 2009 our members were openly attacked by the ANC, with the support of the police, and driven from their homes in the Kennedy Road settlement. Leading figures in the ruling party supported that attack, including Willies Mchunu. Since 2013 our movement has suffered a number of assassinations and killings. In March 2013, Thembinkosi Qumbela, who was not a member of our movement but did support a land occupation that our members also supported, was assassinated in Cato Crest. In June the same year Nkululeko Gwala, our Chairperson in Cato Crest, was also assassinated. In September that year Nqobile Nzuza was murdered by a police officer during a protest in Cato Crest. She was 17 years old. After a long struggle the police officer that murdered her was convicted of murder. In September 2014 Thuli Ndlovu was murdered by two ANC Ward Councillors. After another long struggle the two Councillors were convicted of murder and are now serving their sentence. In June last year we lost two weeks old baby Jayden Khoza after he inhaled teargas when police attacked the community in Foreman Road. In the same month Samuel Hloele was murdered by the Anti-Land Invasion Unit in what was then eMasenseni and is now the eKukhanyeni land occupation. In November our chairperson in the Sisonke Village land occupation in Lamontville, Sibonelo Mpeku, was kidnapped and murdered. On 17 December 2017 Soyiso Nkqayini and Smanga Mkhize, were shot by unknown men in the eNkanini land occupation in Cato Manor. Comrade Smanga was seriously injured and Comrade Soyiso, the Youth League organiser in the occupation, passed away. In January this year Sandile Biyela, was killed while escaping a brutal police attack on the Solomon Mahlangu land occupation. When we formed our movement in 2005 it was clear that our lives did not count to the government, the ruling party or to the elites in this society. We knew that we were being left to live like pigs in the mud and to burn in the shack fires. When our resistance started to become a threat to the NGOs we learnt that we were also people that could be lied about with impunity. When our resistance started to become a threat to the ruling party we learnt that we were also people that could be killed with impunity. We have learnt that for us the price for land and dignity is paid in blood. Comrade Ngcobo was a brave and honest leader held in high respect in his community and in the movement. He led the occupation in eKukhanyeni, founded a creche and campaigned for the development of the area. He resisted in difficult times. When Samuel Hloele was murdered by the Anti-Land Invasion Unit Comrade Ngcobo was there and led from the front. We have lost a cadre and a leader in Comrade Ngcobo. We will bury him with the dignity that he was denied in life and we will make sure that his memory is honoured. The struggle for land and dignity continues. We have learnt that for us the price for land and dignity is paid in blood.